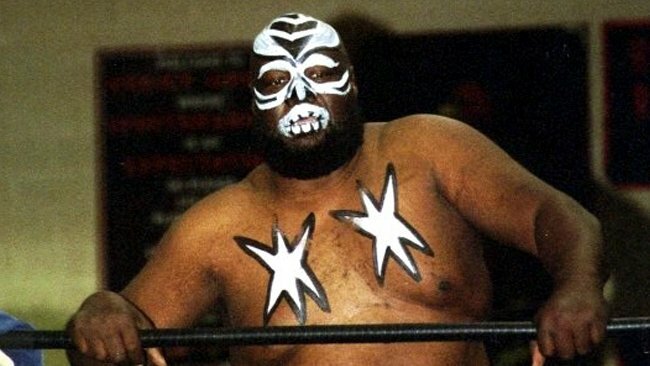 Kamala was on Dan Le Batard’s radio show on ESPN today, and while it was an entertaining listen, it ultimately got very sad. James Harris, who is best known as Kamala, has lost both of his legs due to amputation, and talked about how he never leaves the house and is “just waiting until the time comes.” It was an incredible reminder of the sacrifices that wrestlers make in order to entertain fans. I lived in England for about a year, and I was there to get some experience. It was my choice to do that and after I got some experience I came back to the United States, but I was still just plain James Harris. So, I went to the [Mid-South] Coliseum and Jerry Lawler discovered me. Jerry Lawler saw me as a big guy. Him and Jerry Jarrett asked me if I was looking for work, and I said ‘Yeah.’ They told me to go home and that they’d call me Wednesday. They called me and wanted me to come back to Tennessee, so I was there and that’s when they did the gimmick with all the paint. It did pretty good in Memphis, and then I started doing it myself. So, Jerry Lawler came up with the name and gimmick. I would say the greatest match I ever had would be between Hulk Hogan and Jake “The Snake” Roberts. I had really good matches with them. I was going to the Nassau Coliseum to wrestle him, I was drinking and got pretty near smashed since I don’t usually drink a lot. When I got there I was too drunk to put the paint on my face. Hogan said, “We gotta go on, brother. We’ve got a sell out.” So, Kim Chee made me look like an Indian [by putting a headdress on me], and then pushed me out. When I got in the ring, Hogan had to mostly hold me. He had to tell me what to do [the entire match]. He was telling me to “Slam me, brother.” So, I would slam him and he’d tell me to pat my belly. I just couldn’t think. Both health wise and financially, life has been really bad for me. It’s still bad, but I’m just waiting until the time comes. I have to stay in the house all the time because I don’t have a handicapped vehicle. Every once in a while they’ll try to get me up in the truck and take me for a ride because I’m on dialysis, but that’s what I have to do to stay alive. I lost a leg because of diabetes, but I don’t think I would’ve lost [both if it wasn’t for wrestling]. [One time] I told Vince [McMahon] when my feet and legs were being against me, and I went out to the ring with sandals on. They do wear sandals in Uganda, but Guerrilla Monsoon told me after I came to the back that Vince didn’t want to see me with sandals anymore because it don’t look very African. He wasn’t thinking about my feet, walking around and stepping on thumbtacks [and other debris]. If you want to support Kamala, please pick up his book at KamalaSpeaks.com.